I have had a passion for weather since I was 8 years old. In 2011 I created Higgins Storm Chasing on Facebook which has now grown into a successful meteorology business. Issued 21st January 2019. The monsoon trough is becoming active this week across Northern Australia with a number of Lows and even a Cyclone forecast to develop. Queensland and Western Australia are expected to be in the firing line later this week as Tropics fire up with a 3rd round of cyclonic activity this season. Western Australia has failed to see a cyclone or tropical low so far while Queensland has had 2 systems. 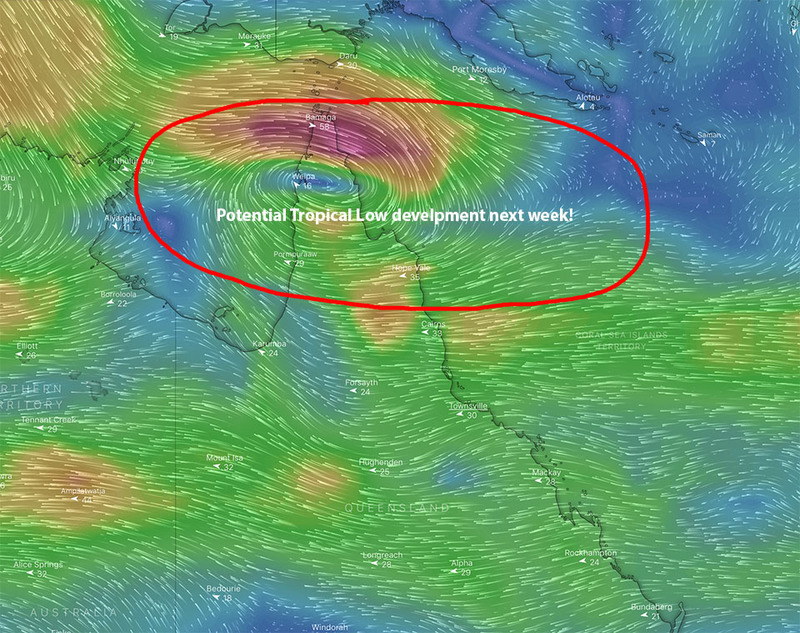 During the week the tropical low near East Timor is forecast to track South West while intensifying. There is an increased risk towards the end of the week that favourable conditions will see a cyclone develop off the Kimberly Coast before possibly crossing the Pilbara Coast. Meanwhile a weak tropical low is developing over far North Queensland. The system is forecast to intensify across the Peninsula district during the week. Global models currently suggest there is a 50% chance the system will develop into a cyclone provided it goes into open waters such as the Gulf Of Carpentaria or Western Coral Sea. 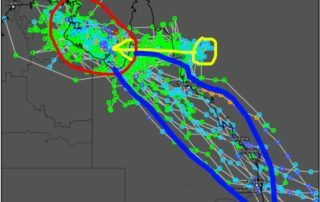 Data from the worlds leading 3 models ECWMF, WRF and GFS indicate the system may move South down the coast as far as Townsville. We will continue to monitor the situation with Tropical Low and or Cyclone forecasts and maps issued on our premium membership service. To subscribe click here! 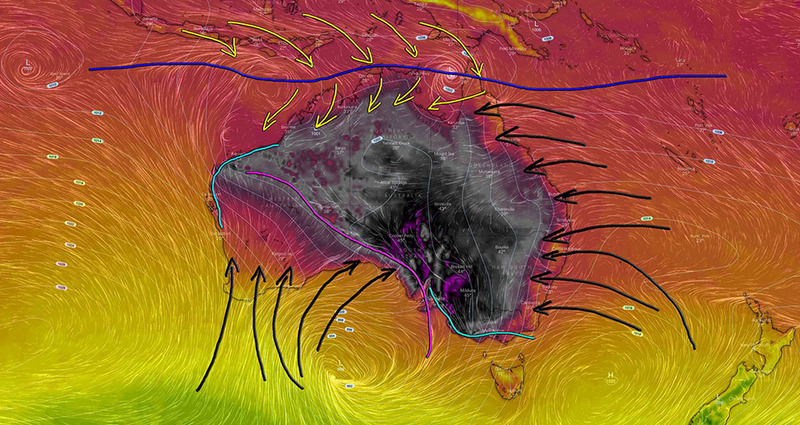 Why have some parts of Australia not seen the “so called extreme heat”?? Issued 18th January 2019. Hopefully this extensive synoptic explanation helps. The extreme heat has been governed by an extensive low pressure trough stuck between 2 broad highs. This very slow moving trough has been feed in heat from the Pilbara, WA across into other parts of the country for the best part of a week now. Please reference above image: The positioning of the trough has been vital for who gets hot and who doesn’t, with temperatures of up to 20ºc differing either side of the trough. 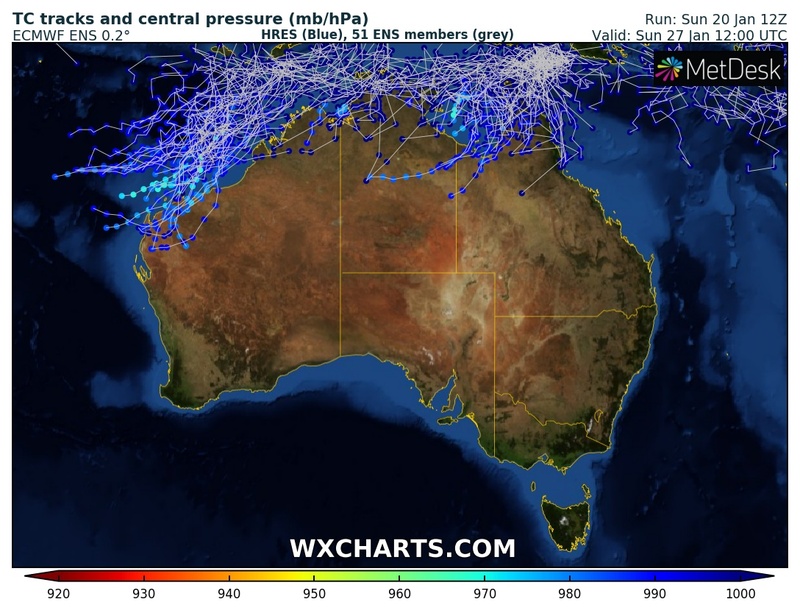 This trough (marked in purple) earlier in the week was situated over the Bight and across South East, Central and North West WA. 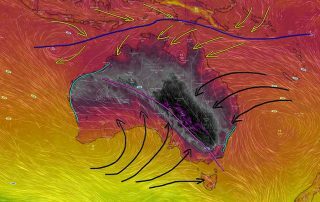 This allowed large parts of South East Australia, South Australia and Central Australian regions to bake under widespread significant heat. Today that trough can now be seen over South East Australia, Central Australia and into North West areas. A large oblong shaped high is located over Southern WA and the Great Australian Bight. This high is feeding cooler air in behind the trough which is now impacting Southern SA, parts of VIC and TAS. It has been so dominant over Southern WA that places like Perth have largely avoided the heatwave. Another high over the Tasman Sea has also been very stubborn and not moving. This high has been the reason why the trough can’t progress further East and why the heatwave is lasting 7 to 10 days rather than 3 to 5 max which would be more normal. 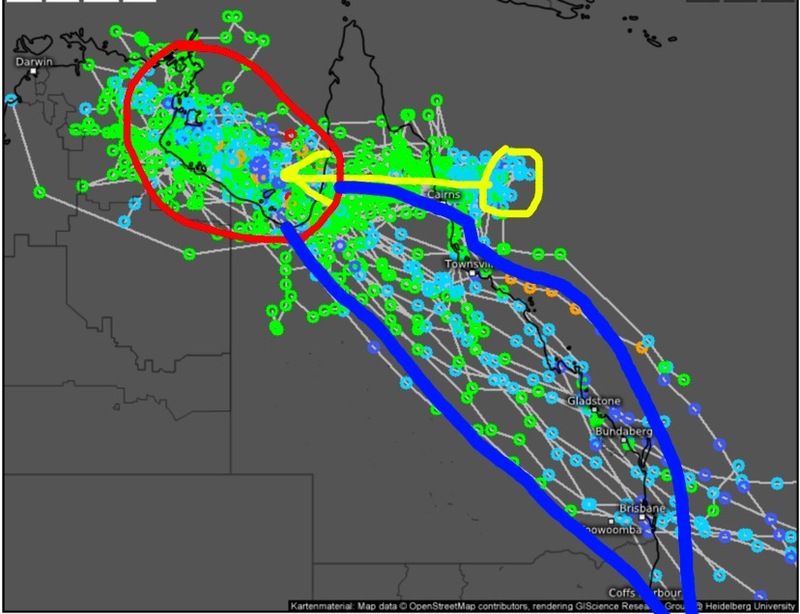 This same high though is directly an onshore flow over QLD and that onshore flow has not only blocked the heat from coming across to populated areas of QLD, but due to no trough being in place across localised areas it has also hindered any storm chances from occurring. Thats why the heat has been so focused over Western and South West QLD as a State perspective with no rainfall. Today you can also see localised surface troughs (marked in aqua) over Eastern NSW and the WA Coast. Both of these will prevent a seabreeze from occurring and thus places like the Pilbara should once again see hot temperatures and why places such as Western Sydney are expected to climb into the mid 40’s. 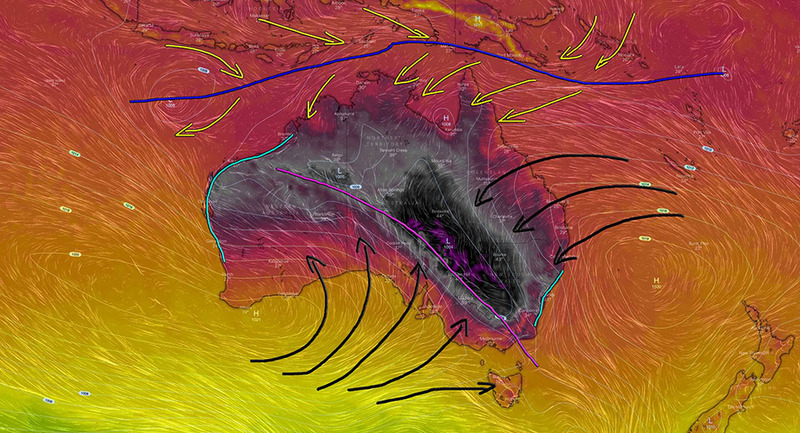 Thankfully this is normal for the Pilbara and the seabreeze will eventually push the trough back Inland and allow for afternoon cooling, while the change (purple line) will move North and eventually reach those Central NSW regions overnight tonight. 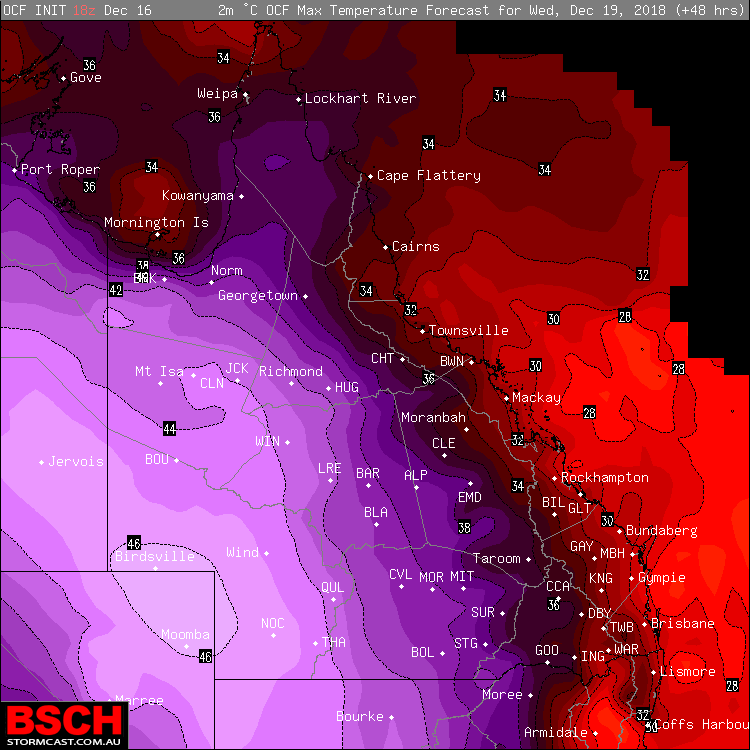 The reason why it has still been humid over Eastern QLD is due to a number of factors. These include the high over the Tasman Sea which is producing onshore winds, while a temperature inversion and dry air aloft is trapping the humidity in the lower levels of the atmosphere. The monsoon trough and monsoon flow (blue line and yellow arrows) has become dominant and stationary across the ocean regions to the North of the Country. This is allowing consistent showers and storms to occur daily across the Northern NT, Kimberley and QLD Peninsula. However the overall system is so weak that this activity has been largely isolated. It’s enough to keep temperatures near or slightly below average, but not producing “good” rainfall. The tropical low has in the Indian Ocean has also suffered as a result of the monsoon strength and thus failed to intensify into a tropical cyclone which was indicated by models late last week. Please reference below image: During the upcoming week, we are expecting another heatwave to move through large parts of the country. Whether it’s as intense or prolonged we will have to wait to see. But a brief rundown for next Thursday shows a low over the Bight which is combining with a high over the Tasman Sea to produce a trough which will block any sea-breeze or South Westerly wind flow over South East Australia. A seperate trough (most likely a cold front) will be over the SA Coast and extending into WA. This will allow hot North West winds to be directed into SA, VIC, NSW where temperatures will skyrocket. The low will subsequently produce an onshore South West flow over WA which will lead to continued tame temperatures. The high will help continue on with an onshore flow over QLD and NSW which will keep Coastal areas tame, but Inland areas may start to see the temperature increase courtesy of the overall warm air aloft dominating. While large parts of Australia endures severe heatwaves, most of Queensland has been without rainfall for over a month or more now. We are constantly looking ahead at forecasts for any signs of a rain producing system anywhere in the state. Many people are continually asking ” When is it going to rain”? A persistent High pressure area over the Tasman Sea has blocked any troughs from developing across Central, Western and Southern QLD which are needed to produce rain and storms. Luckily this has held the high heat inland but we still need rain even if it’s roasting hot or not. An onshore South East flow has produced some good showers along the North Tropical Coast while a weak monsoon trough has triggered some rain and storms across the Peninsula. These areas are doing ok.
It’s the rest of the state thats suffering… At this stage very little rainfall is forecast across Northern inland, Central, Western and Southern districts for the next 7 days. 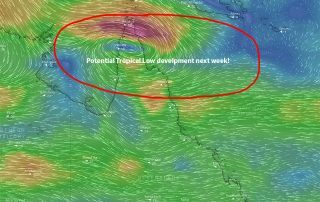 What we are looking at though is the potential for a Tropical Low or even a possible cyclone to develop next week across Northern parts. This system may be centrally located either in the Gulf or Coral Sea at first. 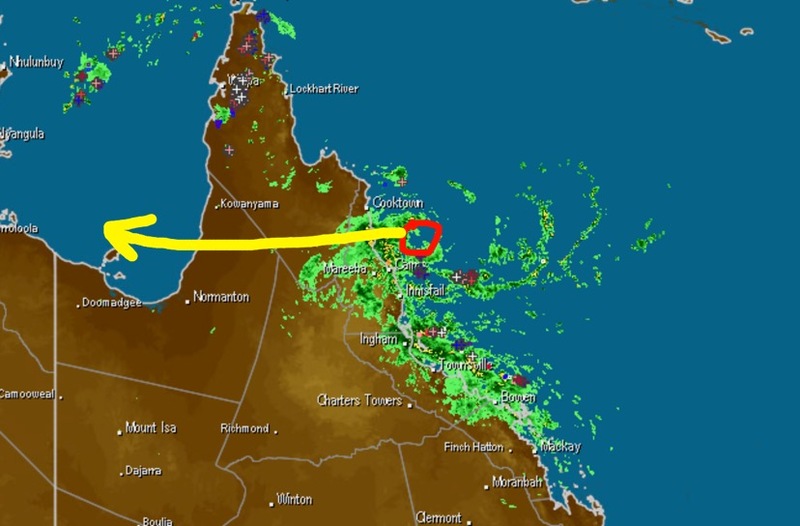 Should this eventuate, rain and storms are likely across NQLD however will will be looking for any indications that the system could move further South into inland areas or down the coast. 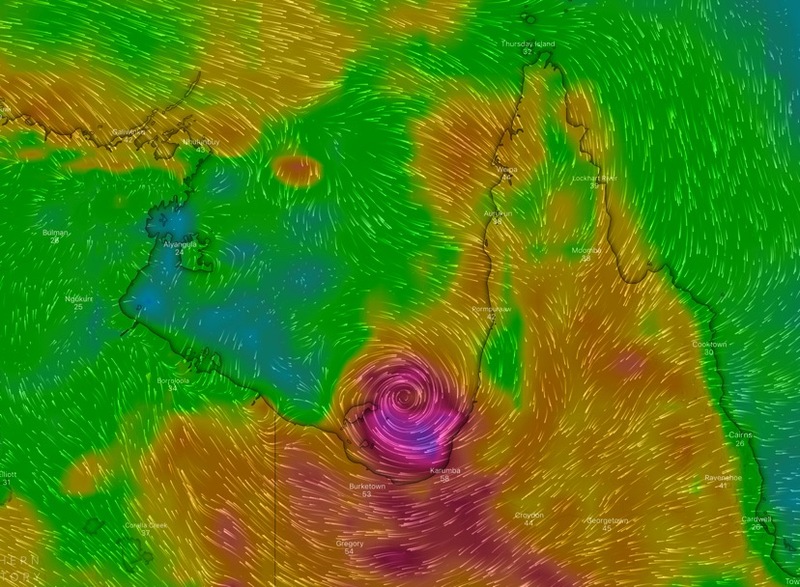 Some suggest a cyclone in the Gulf while others do bring it down into the Northern / Central inland areas. It is just too early to confidently say yet but the signs are there for something… lets just hope it holds and a good scenario plays out. Detailed rainfall, storm, Tropical Low and Cyclone maps available for Queensland by clicking HERE! Issued 17th December 2018. 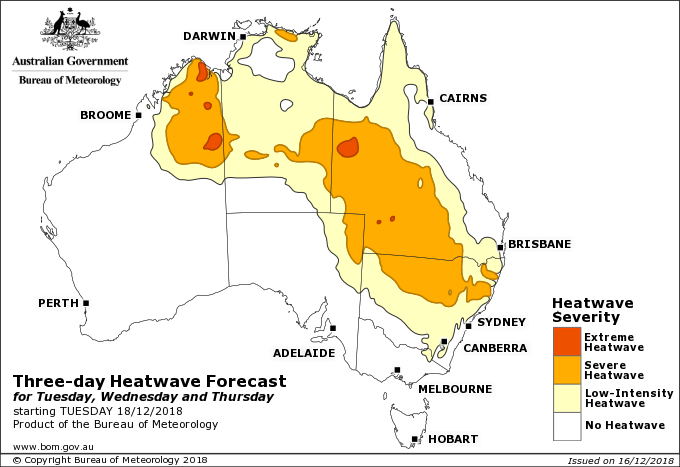 A severe heatwave is forecast to impact the Western half of Queensland this week with temps up to 46C. Above image via BOM. 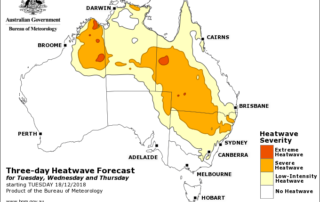 No rain, continued drought, dust storms and now the Western half of QLD is facing yet another very hot period. TC Owen has failed to deliver any relief to Inland QLD over the past week due to dry Southerly Winds wrapping around the back of the system. A low pressure trough with dry hot North West winds is developing across the far West on Monday which will hang around for most of the week. Widespread maximum temperatures into the mid 40’s are forecast with Birdsville expecting 46C. Initially the heat will be confined to areas West of Goondiwindi , Emerald, to Georgetown but this will spread further East into the South East and Central inland on Friday. Mt Isa, Cloncurry, Richmond, Winton, Longreach, Boulia, Blackall and Windorah are all forecast to get 5 days or more straight above 40C. Charleville, Birdsville, Thargomindah, Quilpie and Cunnamulla about 4 days over 40C. Minimums will also be very very warm. In the South East on Friday Ipswich and Gatton are looking at 40C temperatures with slightly cooler conditions along the coast. A cooler change moves through the South West on Thursday and across the South East on Saturday but no relief further North until about Sunday. Below image showing max temps on Wednesday via BSCH. Issued 10th December 2018. Given the current agreement between ALL global forecast data sets EX TC Owen is highly likely to develop into a SEVERE tropical cyclone in the QLD Gulf of Carpentaria this week. The cyclone is forecast to cross the South East Gulf on Friday afternoon then rip South East down the Eastern QLD coastline on Saturday, Sunday and Monday. • EX TC Owen is expected to enter the Southern Gulf waters during Tuesday. Due to a very favourable environment the system is likely to rapidly intensify. • During Wednesday & Thursday Owen is forecast to continue intensify into a SEVERE category 3 cyclone over the Southern Gulf region. • The ECMWF HIGH RES model (best in the world) suggests TC Owen could become a SEVERE category 4 system on Friday while tracking South East near Mornington Island. A majority of other global models agree with this scenario. 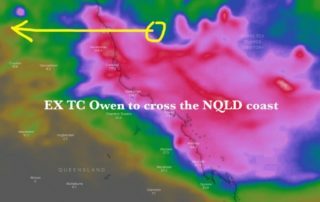 • A majority of global models also suggest that TC Owen will cross the Southern Gulf between Kowanyama and Karumba before tracking South East down the QLD coast just inland from about Townsville to Fraser Island later this week, “similar” to EX TC Oswald in 2013. • At this stage widespread rainfall totals of 100 to 200mm are likely accompany the system along the entire East Coast of QLD. Any shift in the final track will greatly alter rainfall forecasts. • People living in and around the Gulf Of Carpentaria and Islands need to closely monitor cyclone forecasts and have your cyclone emergency kits and plans in place. The Southern Gulf, Islands and nearby land areas are expected to receive damaging to destructive winds, heavy rainfall, flash flooding and significant storm surge. 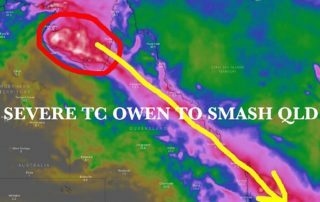 ⋅ People along the entire QLD coastline and adjacent inland areas also need to prepare for severe weather, due to a then EX TC Owen with damaging winds, heavy rain and flash flooding. Below image showing satellite simulation from ECMWF Weather.us on Friday as a severe category 4 system in the Southern Gulf near Morning Island. Issued 10th December 2018. Given the current agreement between global forecast data sets we feel compelled to issue this cyclone forecast alert. • EX TC Owen is expected to enter the Southern Gulf waters during Tuesday. Due to a favourable environment the system is likely to intensify. • During Wednesday & Thursday Owen is forecast to rapidly intensify into a cyclone over the Southern Gulf. 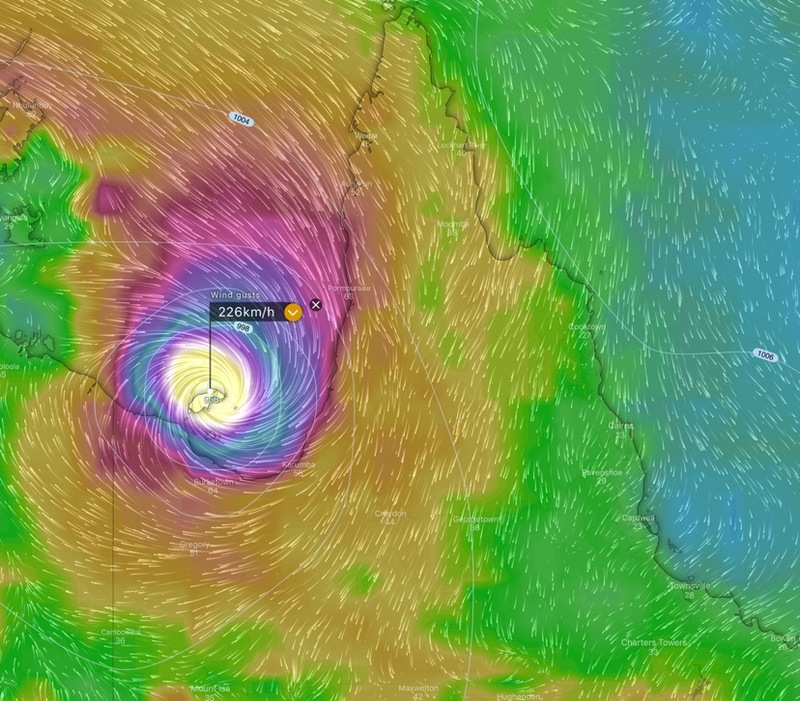 • The ECMWF HIGH RES model (best in the world) suggests TC Owen could be a SEVERE category 5 system on Thursday while tracking South East directly over Mornington Island. This would be a worst case scenario but demands a level of respect. 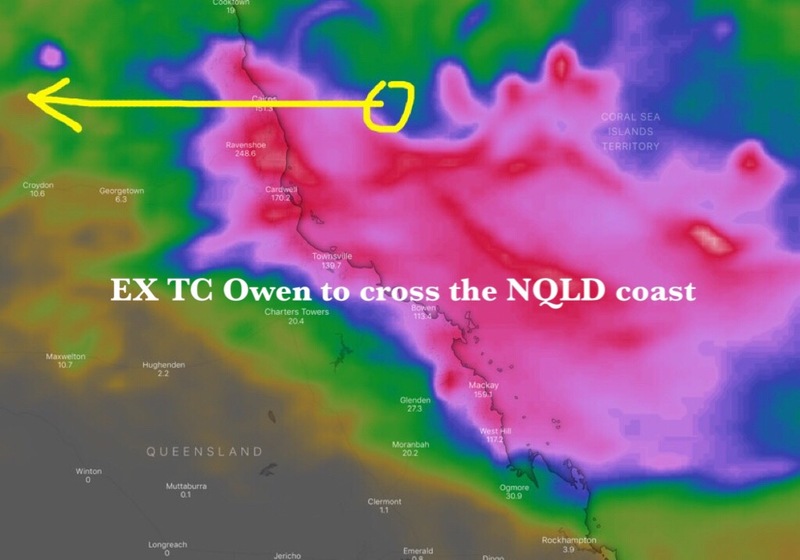 • A majority of global models also suggest TC Owen will cross the Southern Gulf and track South East down the QLD coast from Cairns to Fraser Island late this week, “similar” to EX TC Oswald in 2013. 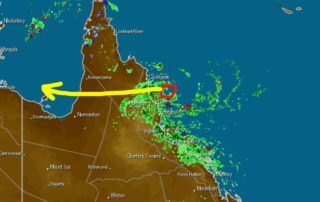 • At this stage widespread rainfall totals of 100 to 200mm could accompany the system along the entire East Coast of QLD. Any shift in the final track will greatly alter rainfall forecasts. 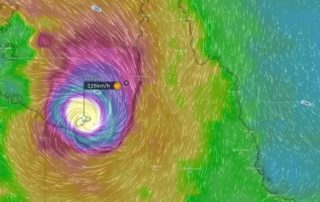 • People living in and around the Gulf Of Carpentaria need to closely monitor forecasts and have your cyclone emergency kits and plans in place. If EX TC Owen remains over the warm Gulf waters, the favourable environment would allow for intensification into a strong Tropical Low by Thursday. A very strong West to North West monsoon wind flow is also forecast to feed and develop the system. A high pressure ridge is expected to build across Central Australia and this would become the initial steering mechanism to block to system from moving further West into the NT. People in living in and around the Gulf Of Carpentaria through the North East NT and Northern QLD should closely monitor forecasts this week. Given the likely intensification, it is expected to bring heavy rain, flash flooding, strong to damaging winds and above normal high tides. On Saturday, Sunday and Monday the worlds leading forecast model ECMWF has been constantly suggesting that EX TC Owen will track South East from the Gulf across much of QLD. IF this scenario were to play out severe weather with heavy rain, flash flooding and strong winds would accompany the systems path. Below image: Next 10 day rainfall forecast totals via Windy.com Blue-Green 25 to 50mm, Pink 100 to 200mm. 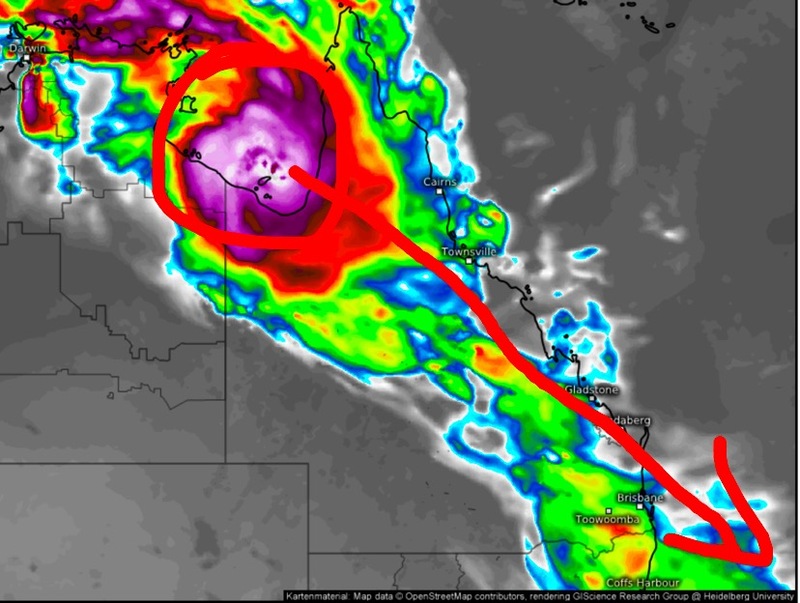 During Sunday night into Monday the system will not become a cyclone however it will continue to produce strong winds and heavy rain from about Cooktown South to Bowen. The bulk of the activity will be across the North Tropical Coast, North East Gulf district and Peninsula where scattered storms are all forecast which may contain heavy rainfall. On Tuesday it is forecast to enter the South East Gulf Of Carpentaria with Strong Winds, Rain areas and scattered storms across the Southern Gulf and Islands, North East Gulf districts and Peninsula. Due to being over warm water and in a favourable environment EX TC Owen is forecast to continue to intensify on Tuesday and could become a cyclone again on Wednesday. MORE information about the extended forecast will be issued tonight so stay tuned! 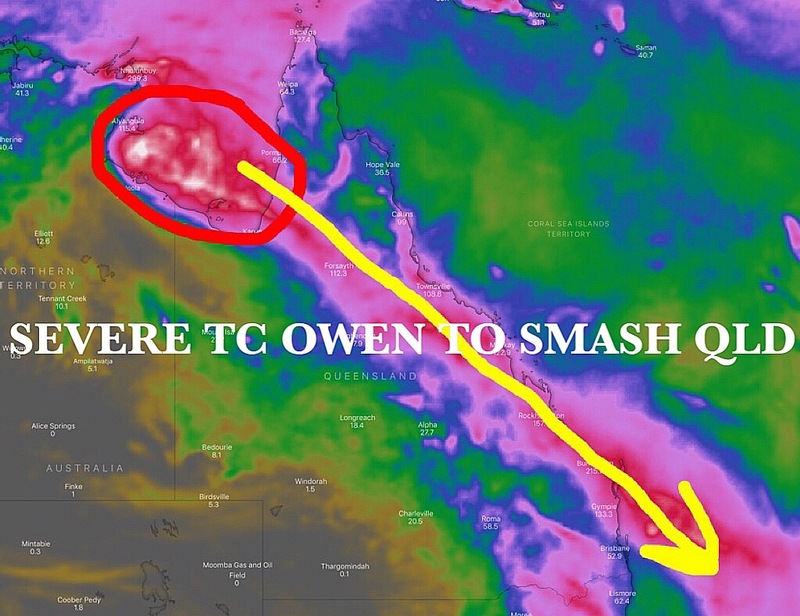 Currently on Friday evening, EX TC Owen is located 550km East of Cairns moving West. He is forecast to cross the coast somewhere between Cooktown and Cardwell on Sunday night. A very deep South Easterly onshore will continue extend South down the QLD coast on Saturday bringing increased rain and winds. Thunderstorms with locally heavy falls are forecast from Cooktown South to Mackay on both Saturday and Sunday. Rainfall activity is likely to peak during Sunday and early Monday before easing. 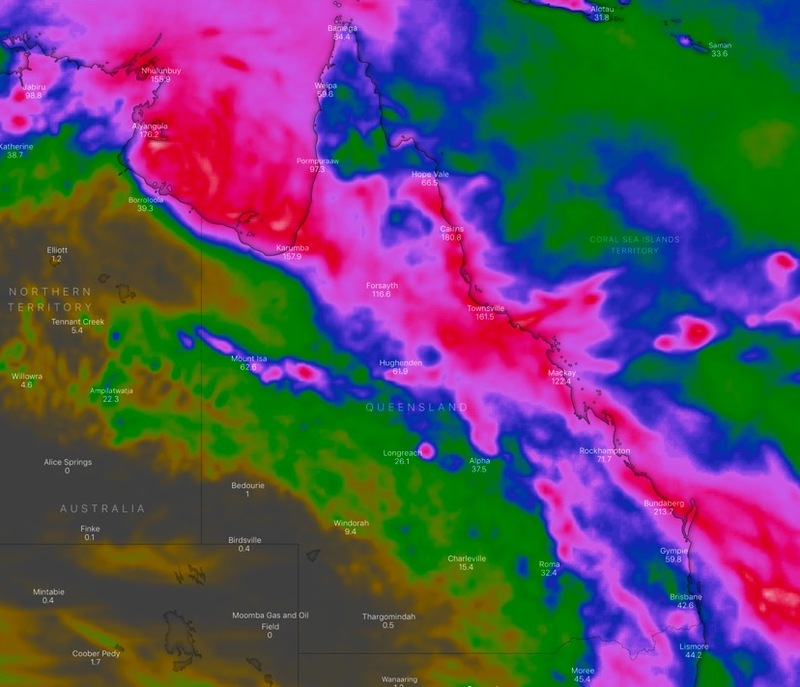 At this stage the following rainfall totals are forecast: Cairns 150mm, Innisfail, Tully and Ingham 200 to 250mm, Townsville and Ayr 150mm, Bowen 100mm, Whitsundays Airlie Beach, Proserpine, Mackay and Sarina 150 to 200mm. These totals are likely to cause some flash flooding, river and creek rises. Strong gusty South East will continue until the system crosses the coast. These winds may reach over 90km hr mainly across the exposed Whitsunday Islands. By late Monday afternoon conditions will ease with a few showers and North East winds due to the low being well inland and weakening. This is good news for these areas after a enduring a very long dry spell, extreme extended heatwave and recent fires.